For a rifle, either carbine or mid-length are the two universal gas system used this day. A rifle gas system can provide energy to operate autoloading firearms. The primary mechanism is creating high-pressure to make a force pushing the bullet out of the case, then a small proportion of gas reverse to the next shoot. You may wonder what the difference carbine vs. mid length gas system? To answer this question, we need to look into the critical factor of both types of equipment carefully, so let check out our analysis and review below. I’m sure that you will have enough information to find out what is better for your demands. The gas port pressure can affect directly on the bolt velocity of the rifle. Higher stress means higher bolt velocity. The peak gas port pressure for the Carbine is 26 000 psi while the mid-length system only is 21000 psi. Some people think that higher pressure is better because it can extract the bullet powerful. But the truth is more complicated. You need enough energy on the system to have the best operation, but if you use excessive pressure, the gun may suffer from extractor slippage, magazine feed jams, or even enhanced recoil. The handguard is a part of the barrel; it’s the place where you put your left hand as a pillar. The main feature of this part is keeping the stable when shooting. So what is the different of handguard between these two gas system? 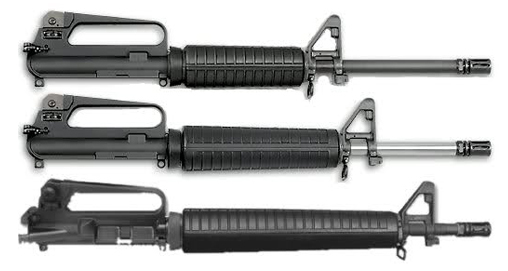 There is an extra 2 inches in the handguard length of the mid-length gas system compare to the carbine. It is longer than the carbine but not too long as the rifle gas system. Shooter having big hands said that they feel more convenient when holding a mid-length rifle. Besides, there is another advantage of the long handguard. With a larger space, you can put a bayonet on your gun more easily. Almost shooter want to add a knife on their rifle although they don’t use it much time. A bayonet makes the gun look more eye-catching than usual. The user adding a knife on their file feel they own a unique weapon. Dwell time measures the duration when a bullet starts moving from the gas tube to exit the barrel completely. This amount of time is very important to estimate the quality of a rifle operation. If the duration of the action is not long enough, meaning the pressure on the bullets doesn't have enough gas pressure. But if the bullet takes too much time to leave the barrel, the power of the ball is also not effective also. This situation is named “over gases,” and it often happens on the 1​​6” barrel, making your rifle shoots less powerful. Therefore, a suitable gas system must perform a perfect timing. From some experiments, we have measured that the dwell time length of the mid-length gas system is 6.5” while on the carbine is 7.5”. Although the mid-length has shorter dwell time length, it makes higher pressure than the carbine gas. In my opinion, I prefer the Mid-length gas system to the Carbine one. Why is the mid-length system a better choice? The mid-length is a new technology while the carbine gas system is used for a decade. A new invention usually has better performance than the old one, and the truth is right. A mid-length gas system is more optimal in the operation of the system than in Carbine. I can feel more convenient when autoloading because the cartridges of the rifle are not jammed. The longer handguard make me feel more comfortable when holding the gun. I can easily add a knife on the barrel, so it looks cooler, and I also have a great bonus feature. There is one important thing that makes me satisfy the mid-length system. The mid-length gas system performs sustainably and effectively on the 16” barrel than the Carbine. And most common rifle today as AR-15 has this barrel size, so if you like a modern gun, then the mid-length is suitable. For me, I always think that modern is still better than the old one, so I love to use the mid-length gas system. However, If you prefer to use some classic 14” barrel rifle, then you should choose the Carbine gas system instead of the mid-length. So depending on your favor and your gun model, you should choose the suitable types of equipment for your guns. Related that: You should choose the best optic for your Ar if you are having an Ar-15! 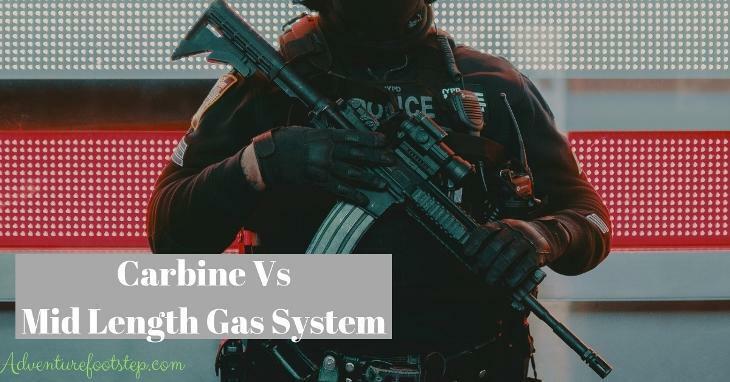 From all the information above, we hope that you can have good knowledge to distinguish and compare between these two fantastic carbines vs. mid-length gas system. If you find this article helpful, please share it with your friends who have the same hobby about firearms.